This guide will walk you through the steps to setup your Pinterest App in order to use the Pinterest Posting Feature. IMPORTANT: THIS PINTEREST APP IS ONLY FOR YOUR USE. YOU WILL NEVER NEED TO MAKE IT PUBLIC, AND WILL NOT NEED TO SUBMIT IT FOR APPROVAL. 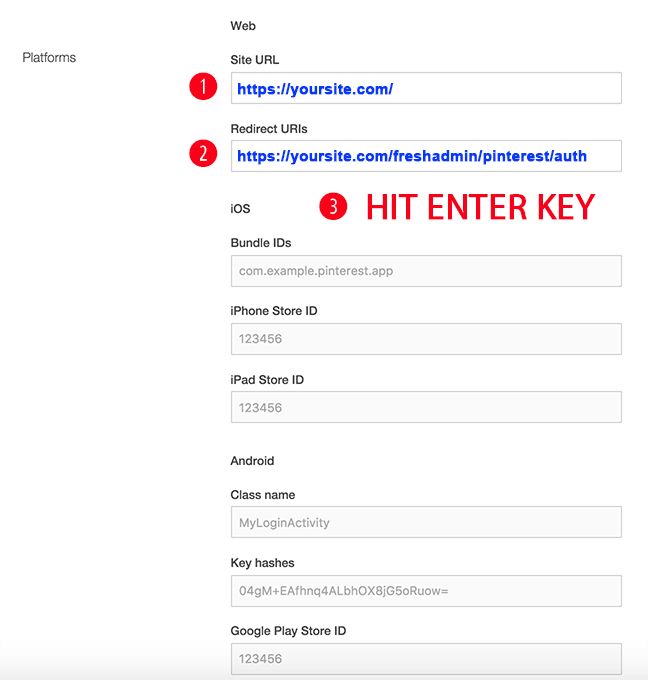 JUST FOLLOW THE STEPS BELOW AND DO NOT WORRY ABOUT MESSAGES THAT SAY TO AUTHORIZE OR SUBMIT THE APP. YOU WILL NOT NEED TO DO THOSE TASKS, THIS IS FOR YOUR PERSONAL USE. 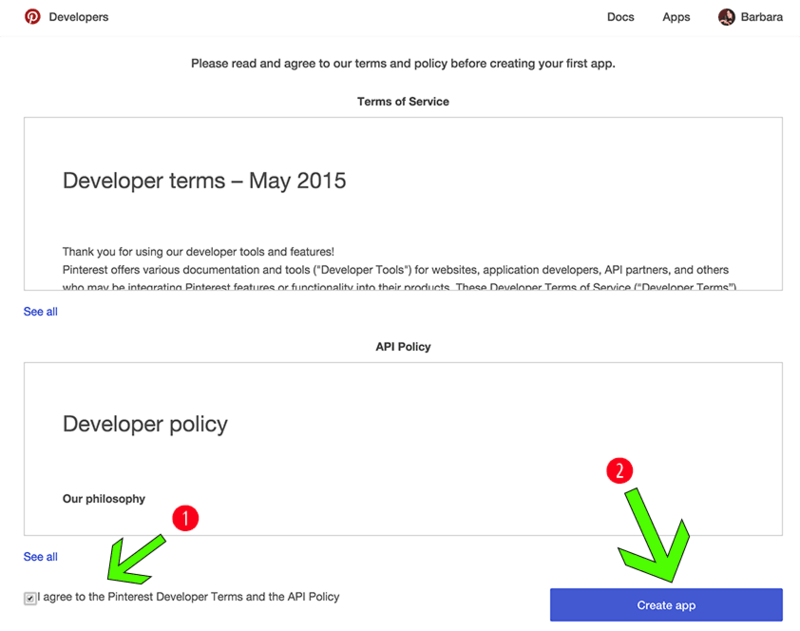 EACH STORE YOU PLAN TO USE THIS FEATURE ON REQUIRES A SEPARATE APP – ONE FOR EACH STORE. If you are not already logged into your Pinterest Account, lick on the “LOGIN” link at the top of the screen. 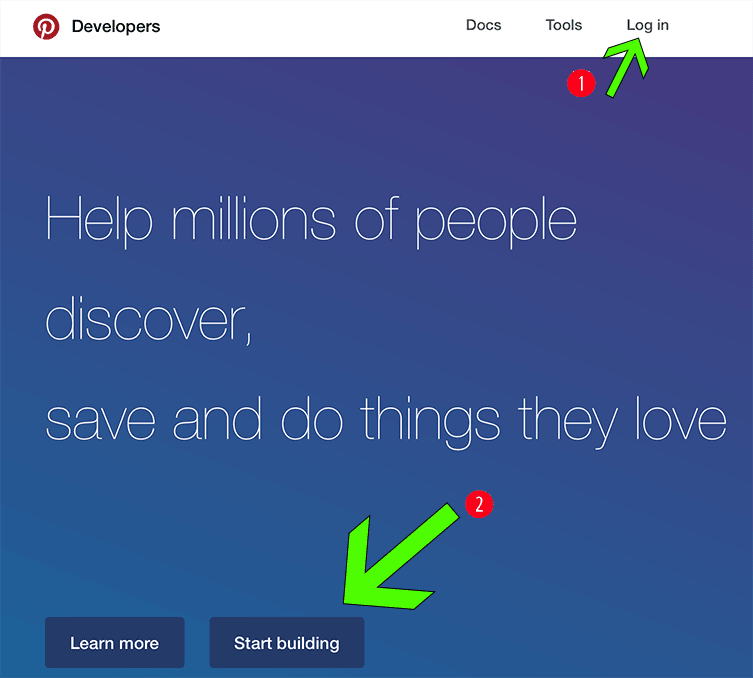 Once you are logged in, click on the “START BUILDING” button. A popup box will overlay on your screen so that you can create your new app. You need to enter a “NAME” and “DESCRIPTION”. This will never be seen by anyone but you, so you can make it descriptive to help you remember. 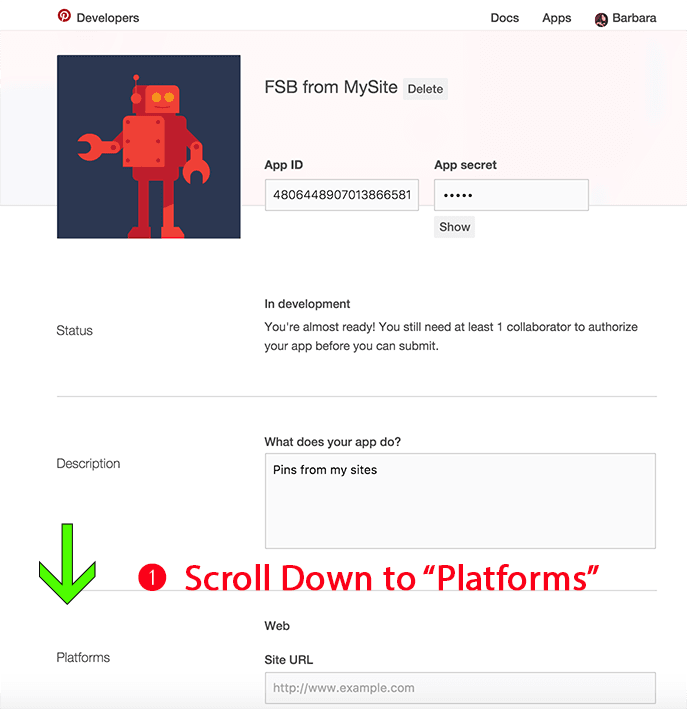 If you have multiple FSB stores, you will create multiple apps – so make sure your Name and Description are unique. Click on the “CREATE” button to continue. The next screen will show you that your App has been created with an “APP ID” and an “APP SECRET KEY”. Scroll down on this screen to the “Platforms” section. Enter the “SITE URL” in the field. This should be your site domain where the store is installed. VERY IMPORTANT: HIT THE ENTER KEY TO SAVE! Once you HIT THE ENTER KEY, a popup will appear that allows you to save your changes. You must hit the enter key, there is no other way to save. 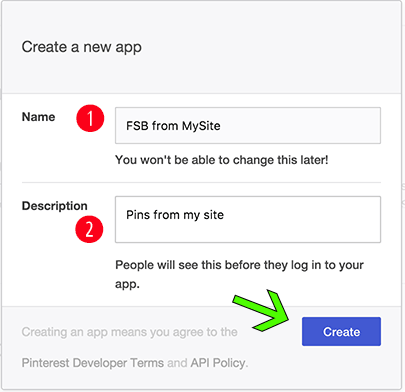 Enter your “PINTEREST APP ID” and your “PINTEREST APP SECRET KEY” and SAVE your changes. Set the Maximum Number of Posts Per Day, choose between 1 to 5 posts total. The default is 3 per day. Set the Time Between Automatic Posts. You can choose times from 15 min up to 6 hours. The default is auto which will space the post evenly over the day. Set the Start and End Times for Posting. These are based on the location time you have set in your Store Settings. 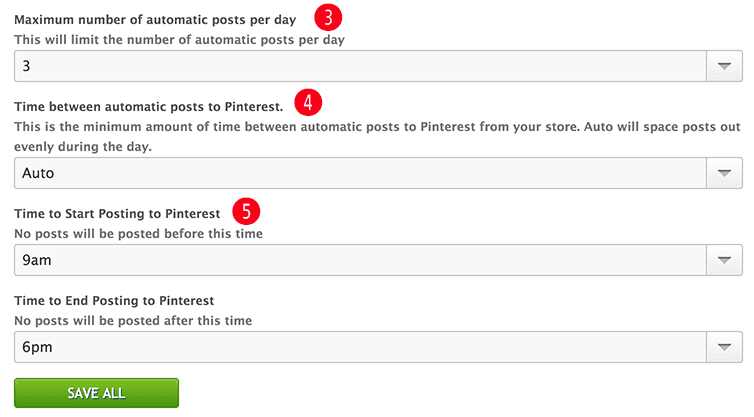 This setting works with the time between posts and maximum number of posts to fine tune your auto posting schedule.